They write: “Chase Hill Farm is a small family farm located in the hills of western Massachusetts near the Vermont-New Hampshire border. 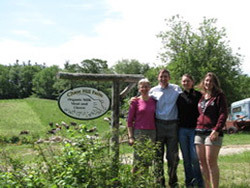 We are Mark and Jeannette Fellows and we have been farming the 264-acre dairy farm for 25 years. We produce high quality milk, cheese, and meat from our grassfed animals. Our herd of 26 Normande cows produces top-quality organic milk seasonally from March to December. Normandes are a French breed of cow known for their grazing abilities as well as the quality of their beef and milk for cheesemaking.